The burning car in which Bashment was travelling. In the foreground is his body. Disc jockey (DJ) Wavel “Bashment” Sabsook was early Sunday morning killed in a road accident at Diamond, East Bank Demerara. 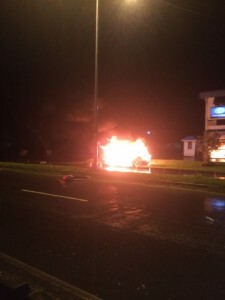 The driver of the ill-fated car said another speeding vehicle clipped his at about 5 AM, causing his to topple and burst into flames. Sabsook flew out of the vehicle and he died on the spot. 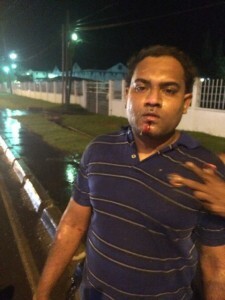 He was reportedly returning to his home at Grove, East Bank Demerara from a party on the West Demerara. Police confirmed that they were probing the accident that occurred just outside Distribution Services Limited (DSL). Sabsook was the second child for his parents to have died by accident. The first was his sister several years ago on the Linden-Soesdyke Highway. He leaves to mourn his mom, whom he supported, and a daughter. The driver of the car in which Bashment was travelling.